Quick tidbit– When I refer to hummus in this post, I am speaking of garbanzo beans or chick peas which in Arabic are called–hummus. When we walked through the Medan in Damascus, (shopping near in laws) the streets were alive with the sights and sounds of the Middle East. It was actually more like something out of a movie but true to life. Spices, falafal, fresh lamb hanging outside of shops, Busa (ice cream) and fried Shawarma sandwiches. Men stood outside of their shops watching the t.v. above them, engrossed in the latest soap opera that was trending around Syria. 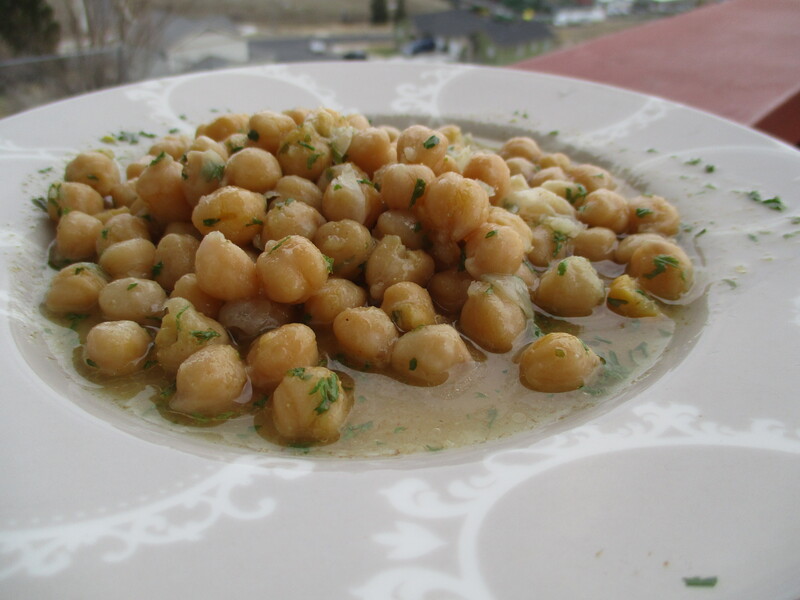 One very simple food that would not make the list of exciting and interesting, is this garbanzo bean treat. In years past beans were cooked, salted, seasoned and scooped up for a few coins. My son, Abdullah remembered this when I made dry garbanzo beans for Falafal. He asked if he could take some and immediately added the spices he had remembered when visiting Taita’s (Grama) house. When I made this dish I used dry garbanzo beans, soaked them and boiled them, you can use canned beans as well. I will not explain soaking or cooking in this post but I am adding the option of using dry beans for those who are accustomed to preparing them. I usually use warm beans from my large pot of cooked beans that I make for other recipes, so you can heat your beans if you prefer them warm. Heat beans, add the lemon juice, salt, cumin, garlic, parsley and gently mix, add olive oil and stir. These measurements are purely based on taste. You might add more or less salt, lemon juice, cumin and garlic. This simple treat is delightful and in our family eaten as is, or with Arabic bread.